Walt Coleman is the referee, heading up Terry McAulay’s crew. First half. No replay reviews. 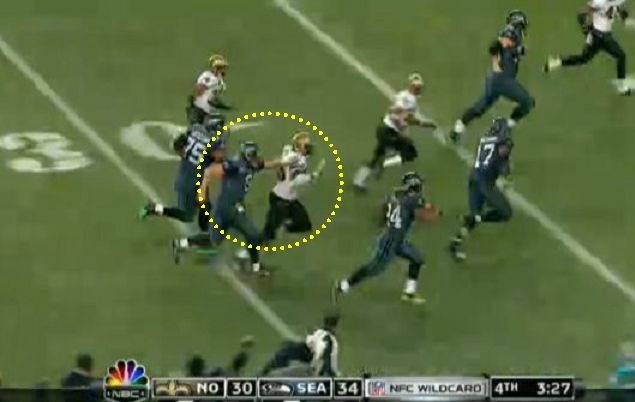 Saints have 4 penalties for 18 yards, Seahawks 3/14, no penalties declined. 4th Quarter, 3:38 remaining. On the amazing touchdown run by Seahawks running back Marshawn Lynch, did quarterback Matt Hasselbeck throw an illegal block in the back? No penalty was called, likely because the officials determined the Saints defender wasn’t knocked over (he, instead, dove for Lynch) or otherwise disadvantaged (video, after Lynch passes the 30-yard line). No offensive player may … lift a runner to his feet or pull him in any direction at any time. Had there been a score, it would have been a re-try from the 12-yard line. Final. Not a busy night at all for replay official Earnie Frantz. No challenges, no replays for the entire game, and nothing that he missed in the last two minutes that was worthy of a review. Easy money. Gene Steratore is the referee. 1st Quarter, 13:29. No challenges in Game 1 of the doubleheader; first challenge in the first two minutes of the second one. Colts coach Jim Caldwell challenged whether Jets punt returner Santonio Holmes was the first player to touch a punted ball. Holmes was oddly hovering over the rolling ball, because if he touched it, even accidentally, it would have made a live ball, which the Colts would have recovered. Steratore upheld the play on the field that the ball was first touched by the Colts. 2nd Quarter, 8:21 remaining. A punt to the goal line appeared to be saved from a sure touchback by the Jets, but field judge Terry Brown, side judge Michael Banks, and back judge Greg Steed conferenced at length at the goal line before ruling touchback. Replay showed that the Jets coverage player put his right hand on the goal line, making the ball “in” the end zone by extension. End of first half. Other than the replay called in the opening minutes of the first quarter, no other replays were called for. Jets have been penalized 3 times for 15 yards; the Colts have not been penalized. 4th Quarter, :40 remaining. A catch by Jets receiver Braylon Edwards with a fumble and self-recovery was reviewed. Steratore said that Edwards completed the catch with the third foot down, followed then by the fumble. Yes the 2 point conversion included aiding the runner, but no NFL crew would have had the stones to make the call. I have called it once in 36 years and was ridiculed by my friends.